Keeping an aquarium can be a fun, educational and rewarding experience. Starting your first aquarium has never been easier than it is today. Use this beginners setup guide from our experts here at That Fish Place - That Pet Place to get you started on a successful and fascinating adventure with your first aquarium. Take a look around and find out what you like the most. When it comes to fish, there are literally thousands to choose from. Make sure that you know what your are getting into ahead of time. You can browse our website for inspiration where we have lots of information about the Saltwater Fish, freshwater fish, and brackish fish that we offer for sale. There is also a wealth of other information easily available to you; visiting our retail store, checking out online aquarium forums, and browsing YouTube videos can all provide you with great information to figure out where you want to start. Some things to consider once you have found some fish you like: How big will it get? What size aquarium will it need? What kind of water chemistry does it require? What other fish will it get along with? What does it eat? Once you have decided on the fish, you can choose the proper aquarium set up! The following principles are for any type of aquarium, Freshwater or Marine. At this point, you should have some idea for size of the aquarium you need for the fish you desire. You now need to consider the location for your aquarium, and narrow your fish keeping decision to match your available space. Choose a location n a room that does not get too hot or too cold, and try to avoid locations where the tank will receive direct sunlight. The tank should be located in a place that is perfectly flat since a leaning tank is not safe. Take measurements of your selected location, and then you can shop for your aquarium options. If you are not purchasing an aquarium stand along with your tank, make sure you have the proper support for your aquarium-they are heavy once they are filled with water and regular cabinets and shelves aren't always strong enough. 1 gallon of water weighs 8.5 pounds. That means a 20 gallon aquarium will weigh at least 170 pounds! 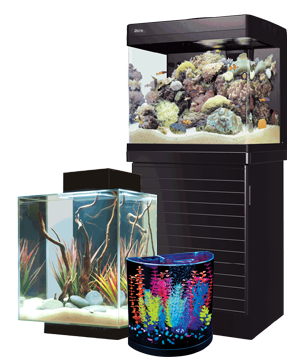 Choices available today are plentiful, especially in all-in-one type Aquarium Kits that make set up easier than ever before. There are many things to consider when choosing an aquarium filter and aquarium lighting. For informative articles about selecting equipment for your aquarium, check out our That Fish Blog entries about choosing your Aquarium Filter and Aquarium Lighting. If you are being brave and setting up a marine aquarium for the first time, you will also want to take a look at Protein Skimmers. You have done a little homework and are ready to set up your first aquarium. You have selected your basic equipment; the only thing that may still be missing in an aquarium heater. A heater is a must for tropical fish that need warm water. A good rule of thumb is 3-5 watts per gallon. Provide the best quality water for your aquarium that you can. If you are lucky enough to have good quality well water, you are ahead of the game. Most of you will need to treat your tap water with a water conditioner to make it safe, removing or neutralizing toxic chemicals like chlorine, chloramine or heavy metals. If you are setting up a more advanced aquarium with live plants, live coral, or sensitive fish or invertebrates, you may also need or want to install a filtration system like a reverse osmosis filter that will provide high quality water for your aquarium. Rinse off all your decorations and gravel prior to putting them in your aquarium, and follow the directions for the filter media in your chosen filter. Many filter media types should be rinsed free of debris before using. Once you have put your aquarium together and filled it with water, go ahead and turn it on. Allow at least 24 hours for your aquarium water to stabilize before adding your first fish. Never add fish directly to a newly setup aquarium, results can be disastrous. Once your aquarium has had 24 hours to stabilize, you are ready to start adding fish. It is recommended that you start your aquarium with extremely hardy "starter fish" that will help to biologically season and prepare your aquarium for whatever other fish you want. Your aquarium water must go through the nitrogen cycle in order for it to be safe for your fish. This cycle is a very stressful time for most fish because the water chemistry goes a less than ideal, as the aquarium matures and builds its biological filter. Some examples of typical "Starter" Fish: Freshwater- Danios, White Clouds, Tiger Barbs. Saltwater- Damsels, Chromis, live rock. Proper acclimation is very important when introducing new fish. Proper acclimation, reduces stress, increases survival rates, and makes for a much happier fish. Follow our detailed Acclimation Procedures, to provide a healthy introduction of your new fish. The Nitrogen Cycle is the process by which nitrifying bacteria colonize in your filter and gravel. This good bacteria takes food and fish waste and breaks it down, keeping your your water safe and clean. During this process, different types of bacterial are growing that do specific jobs. Waste is first broken down into Ammonia, which is very toxic to fish, irritating their gill tissues and causing severe damage to other body tissues. Bacteria then start to grow that convert Ammonia down into Nitrite. Nitrite is still very toxic to fish. It destroys the hemoglobin in their blood, which carries their oxygen. Lastly, Bacteria breaks down Nitrite into Nitrate. 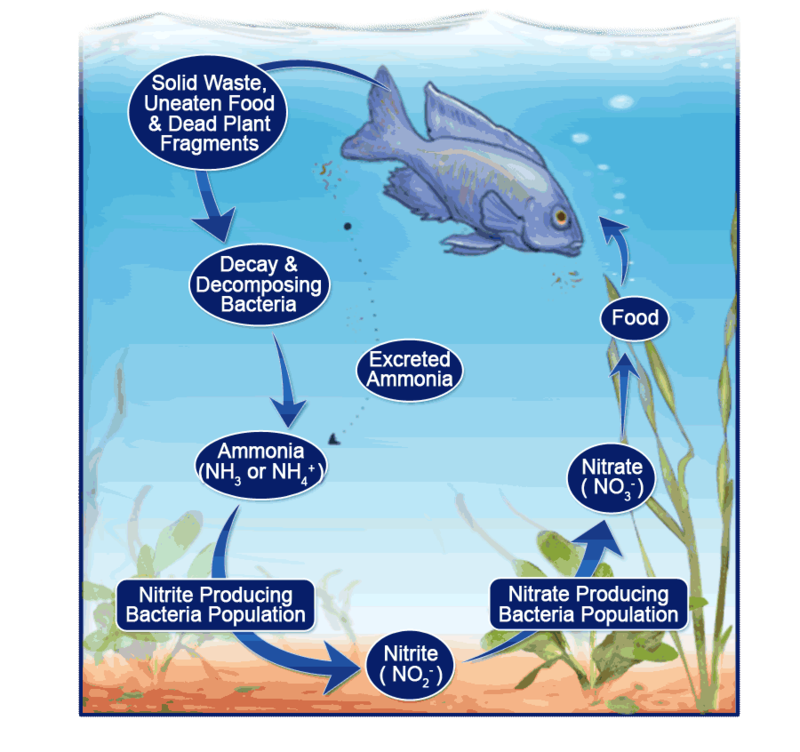 Far less toxic than ammonia and nitrite, Nitrate is the end product of the nitrogen cycle in a closed aquarium. This chemical is only toxic at high levels, above 50 parts per million for most tanks. To keep nitrate at a healthy level, you need do water changes on your new aquarium. A general guide is to remove 25% of the water in the aquarium once per month and replace with new clean water. Live plants also help keep nitrate under control, they use it as fertilizer. The whole cycle usually takes around 4-6 weeks, depending on how quickly your bacteria grow. There are also many Live Bacterial Supplements available to speed up the cycling process, and give your aquarium a little boost through the cycle. Testing of your overall water quality is very important and often overlooked. Your aquarium water may visually appear to be healthy and clean, but this may not actually be the case. Testing your water is simple, whether you are going to purchase test kits and do it yourself, or bring a water sample to the pet store to be tested, and is the key to long term success. Testing during the Nitrogen Cycling process is especially important to make sure that levels are not toxic to your fish. When your water tests show zeros in Ammonia and Nitrite, the cycling process is complete and you are safe to add the fish of your dreams. The parameters that are most important to know in most basic aquariums are Temperature, pH, Ammonia, Nitrite and Nitrate. Make sure your fish are getting the proper nutrition by choosing food specially formulated for your type of fish. You can also supplement with frozen or freeze-dried food for a complete and balance diet. Vitamin and mineral supplements are also available to help maintain a live planted aquarium or reef tank with coral. Chemical-specific filter media or water additives are available to solve high ammonia problems, cloudy water, or any other problems. Don't overcrowd your aquarium...this can cause ammonia spikes and cloudy water! Remember to do water changes once or twice a month to keep your nitrate at a healthy level. Gravel siphoning is also good maintenance in which you vacuum out the dirt that has been trapped in your gravel bed.